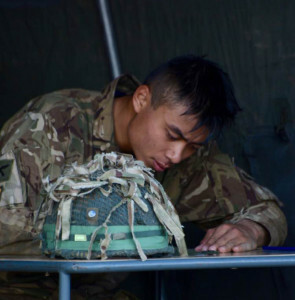 The Queen’s Own Gurkha Logistic Regiment took part in the The RLC Military Skills Competition (formally the Gore Trophy) at the home of the Royal Logistic Corps in Deepcut on Saturday 1st October 2016. Now in its 23rd year, the competition saw 72 teams and 432 competitors from across the Corps battle it out to be crowned Champions in a variety of disciplines. Training started in earnest following a well-deserved summer leave, with a number of concentrated range days and navigation exercises in the local area. 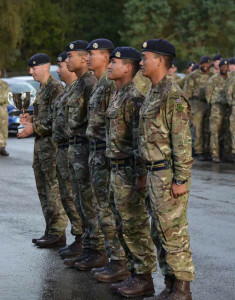 The Commander’s intention this year was to enter a minimum of five teams, a hard task given the pace of 10 The Queen’s Own Gurkha Logistic Regiment battle rhyme. The teams arrived for the weigh-in, accompanied by silent, hidden glances as each team checked out the competition. After successfully completing the kit check, it was out to the start line. This year saw a change to the event sequence, the first event being the navigation exercise. First element down the hill of DCPLA and out across Deepcut Bridge to E1/E2. There were 6 manned check points to find, each one directing you to the next. This is where the team felt well within their comfort zone and the confidence was rewarded with a 2nd, 3rd and 4th position during this phase. The shooting was a different story. Following last year’s disappointing performance, all the teams were particularly nervous. With one plate standing, and only one round left, it was down to the team’s weakest shot to secure a clean sheet. Miraculously, this succeeded in becoming the winning round of the competition. The timed march started with an agonising 400m dash from Range No.2 to the top of ‘concrete hill’. The Gurkhas were in their element here, with no perceptible change in pace between the extremely steep hill and the flat ground that followed. 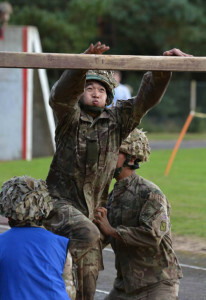 The assault course is always a test for the vertically challenged, compounded by the fact that the team had already covered 7-8 miles with 15 kg and speed. It’s surprising the effects of fatigue on body balance, especially for team captains it seems! 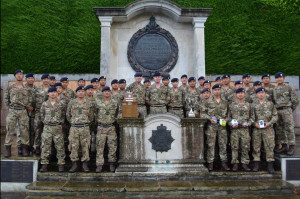 Overall a fantastic result for 10 The Queen’s Own Gurkha Logistic Regiment securing a 1st (C Team), 3rd (A Team), 5th (B Team), 11th (D Team) and 17th (Vets) out of 72 teams! A huge thank you to 25 Training Regiment for organising another outstanding competition, and to all the other participants for providing as with such tough competition. 10 QOGLR 2nd, 3rd and 4th on the Navigation. 10 QOGLR 2nd on the Transition March. 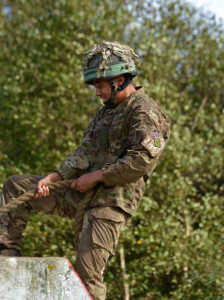 10 QOGLR 3rd on the Assault Course. 10 QOGLR 3rd on Military Knowledge.